I know that I'm suppose to be a "professional" and subjective, but I've been feeling pretty guilty about not lovin' Lovin' Scoopful. It just seems wrong. It's light so it's good for the belly, it gives to charity which is good for the soul, but Yummy Cake & Cookie Dough just doesn't do anything for me. I just have to stand by what I think I guess, and hopefully not have nightmares about Arnold coming to beat me up for not liking his wife's ice cream. I wasn't 100% ready for my evening ice cream, but I really wanted to try the other L.S. flavor. It just seems like the best way to clear my conscience. I went down to grab the container since it's now had 48 hours to completely refreeze in a real freezer. So here it is, So Good Cookies & Cream. 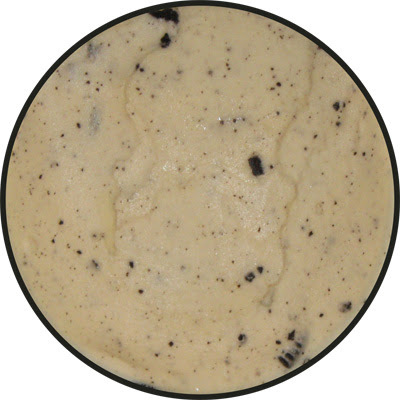 It's your standard vanilla ice cream with cream cookies smushed up inside, but to spice it up (like the other flavors), they've added chocolate cows. The container shows lots of cows & cookies, but I'm not holding my breath here. Second Impression: better, we've got some decent sized cookies and I appreciate the fact that I can actually see some cream in that cookie bit down near the bottom. Before we continue, I have to ask, where are all the cows? Ok, I'm ready! I'm psyched! I've got more realistic expectation! I dig in and... oh the refreeze. As I was digging for cows, I actually found pockets of ice crystals. This is just awful. Foolish Big Y and their antique useless open freezers. Who does this to ice cream? I now really regret going to that particular big Y. When I saw those abused containers I just should have retreated and tried to find a newer store. So, ignoring the freezer burn or refreeze or whatever you want to call it, what do I think? Well, it's still a super quick melt, again leading me to think why people keep describing it as creamy. I like the big cookie bits, but unfortunately I think they come at the cost of not completely dumping the cookie flavor into the ice cream itself. It just doesn't strike me as that strong (though some may prefer it this way). Now the thing that sets this ice cream apart from ever other C&C is the chocolate cows. Mmmm, just the thought of those chocolate cows gets me hungry.... but I have to admit, I was disappointed, but it's because I've been spoiled by high fat ice creams. I took out two servings of L.S. and I got just 3 cows. It's not just that they were only a few of them, it's that their chocolate didn't really seem to compliment the cookies. There are so many wonderful ways to tweak chocolate that I really expected someone to have spent days and days getting just the right cow flavor, but this is not the case. It's a pretty crunchy little chocolate cow due to it's thickness, and the chocolate is decent, in fact, it actually reminds me of an hollow chocolate easter bunny in regards to both flavor and crunch. Now, does a bowl of cookies & cream with a chocolate bunny smushed on top really sound good? Wait, don't answer that. I'm sure it would be fun, but I just don't think it's the right combo. Man, I'm being picky this weekend aren't I? I will say it again, Big Y has wrecked the texture of this ice cream. With that in mind, I would still like to say that if you are going all out to be different, you can't stop before the finish line. I applaud the charity, I applaud the healthy aspect, but I just think this stuff could be better. Hey, at least it's 20x better than that Skinny Cow Cookies N' Cream junk. On Second Scoop: I went in to the freezer determined to enjoy some lovin' scoopful, but to be honest, I'm bored. The lack of true cookie flavor in cookies & cream is just unacceptable in my world, and to top it off, I got but one cow in my bowl. What's the point? The nutrition stats are excellent, and the ice cream isn't gummy, but other than that, that's all I got. Dubba's Note: 5/3/2011 Big Y has announced they are closing this particular store. 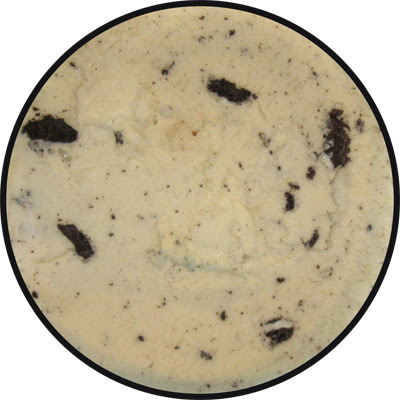 Cookies & Cream rarely excites me anyway, I'm not giving up on Lovin' Scoopful just yet. those chocolate cows remind of the phish in b&j's phish food. though, considering your review, i doubt they're as tasty. the cows aren't bad, I just think they could be better matched. If you're going to be trying different LS flavors, I agree with Rodzilla on doing either Raspberry Cheesecake or Blueberry Pie. Or Mud Pie, but I guess that's a little too much like Cookies and Cream. Perhaps you should bring an ice filled cooler with you to the store, and make sure that at no point does it melt or drop temperature. Just imagine you're doing an organ transplant. I'm so sorry that you had a bad experience. I'd like to make it up to you and offer Zombieman, Dubba, Dink, and Rodzilla a chance to try us, too. 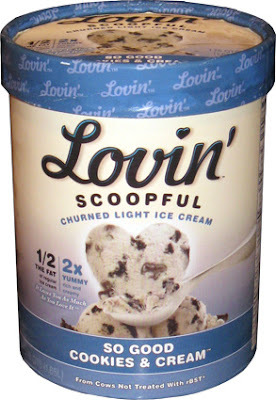 If any of you (up to the first 10 requests) will enter your address at www.LovinAward.com and use promo code #2nd Scoop Blog I'll send you a certificate to try Lovin' on us. I recommend Rockin' Raspberry Cheesecake or Oh My Blueberry Pie if you like a sweet fruity flavor, Yummy Cake & Cookie Dough if you're a child at heart, Mad About Mud Pie if you love coffee EVERYTHING, or Caramel Chocolate Heaven if you like it rich! I hope to hear from you all, and again... I'm so sorry your experience in 2010 was a bad one. I hope I can make it up to you.